TTM Consulting were fortunate enough to be able to obtain some rare tickets for the men’s and women’s beach volleyball Bronze and Gold medal matches. TTM arranged for some of our clients to attend these matches, but also in the company of the five time Olympian beach volleyball player, Natalie Cook. Brian Camilleri (Principal Director), together with five clients, attended the men’s afternoon finals session. This was a bronze medal match between England and New Zealand and the gold medal match between Canada and Australia. New Zealand’s brothers Ben and Sam O’Dea won the men’s bronze medal with a 21-13 21-15 win against Chris Gregory and Jake Sheaf from England. In the gold medal match final, Australia’s Chris McHugh and Damien Schumann beat Canada’s Samuel Pedlow and Sam Schachter with a very close and exciting score 21-19 18-21 18-16 to claim the Commonwealth Games gold. Following the men’s final and prior to the women’s evening session finals, TTM and their clients were treated to food and drink with Natalie Cook. 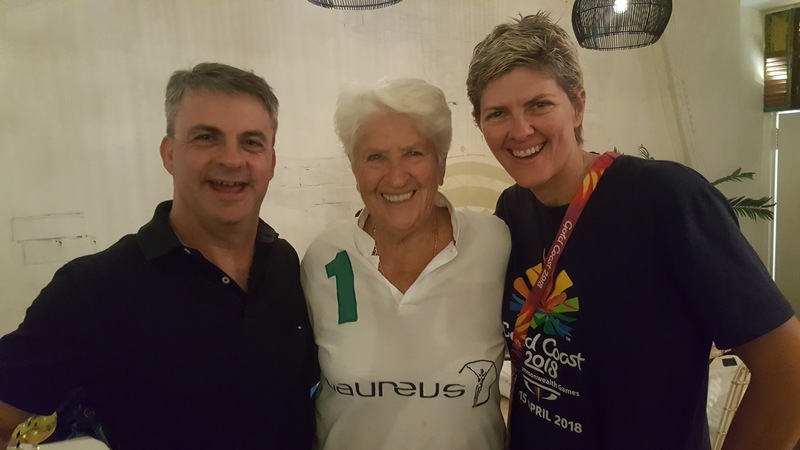 Natalie also brought another special guest, the one and only Dawn Fraser (3 times Olympic Gold medallist for 100m freestyle). It was an amazing experience to meet both of these wonderful athletes and even better to be served a Natalie Cook cocktail, named the Awesome Ace. Following dinner, Richard V Jones (Gold Coast Manager), gathered his group of clients and headed off to the women’s final matches. The bronze medal was between Vanuatu and Cyprus, and the gold medal match was again between Canada and Australia. Linline Matauatu and Miller Pata of Vanuatu won the women’s bronze medal with a 21-14 21-10 win against Manolina Konstantinou and Mariota Angelopoulou of Cyprus. In the gold medal match final, Canada’s Melissa Humana-Paredes and Sarah Pavan beat Australia’s Mariate Artacho del Solar and Taliqua Clancy 21-19 22-20 in a very close match. A magnificent afternoon and evening was had by all at this exciting event and many moments will be remembered.